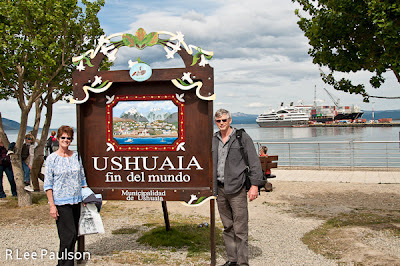 From Off the Beaten Path: South America and Antarctica 13 - Ushuaia, Southernmost City in the World. 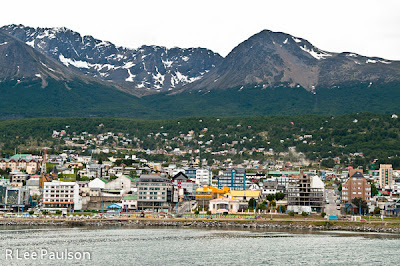 South America and Antarctica 13 - Ushuaia, Southernmost City in the World. Located at the very southern tip of Argentina, in the Tierra del Fuego (Land of Fire) province, Ushuaia is a bustling city of over 60,000. The mountains surrounding this picturesque city, which prides itself as being the southernmost city in the world, are the very southern tip of the Andes mountain range which runs the entire length of South America. The 200 passengers on our ship, all arriving at the same time, would have overwhelmed the scheduled airline carriers. So the cruise company chartered a medium sized Airbus to fly us all from Buenos Aires to Ushuaia. Upon arrival at the modern Ushuaia airport, we were loaded onto five buses and given a tour of the area. 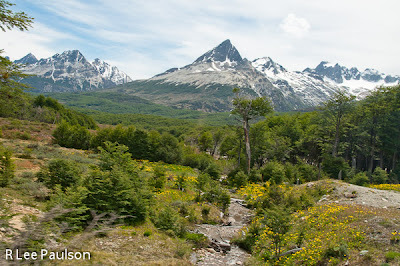 After enjoying the scenery to and from a wonderful national park, I could easily see why folks might want to live here. Of course, there are drawbacks. 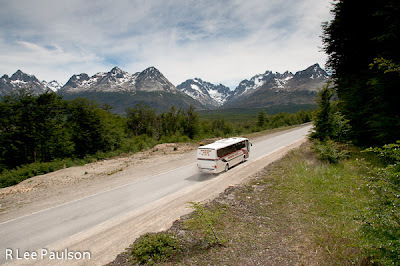 The nice hostess on our bus said that this day, the day of our arrival, was the first sunny, warm day in a very long time. "Be grateful," she said. "It may be months before we see a day like this again." 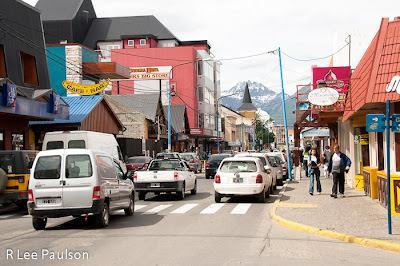 But, Ushuaia didn't start out as a bustling city. 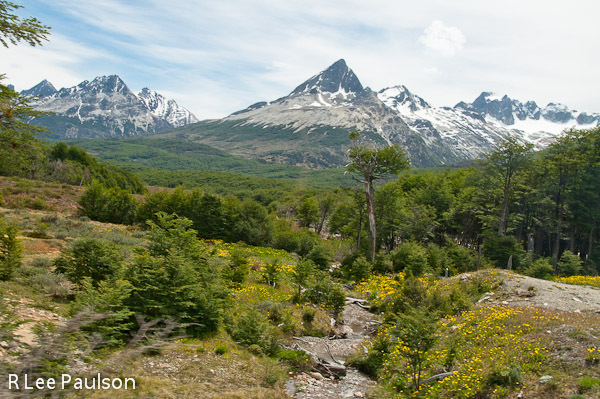 It started out as a Indian village which was later settled by competing Episcopalian and Catholic missionaries. When the territory officially became part of Argentina, the Argentine government, in a stroke of brilliance, decided the best way to populate the isolated territory was to build a prison here. Which they did. Here is a look at one of the old cell blocks in the prison built by the prisoners themselves. When the prison was finished, the prisoners built roads and other infrastructure. Whalers and sealers came, too. 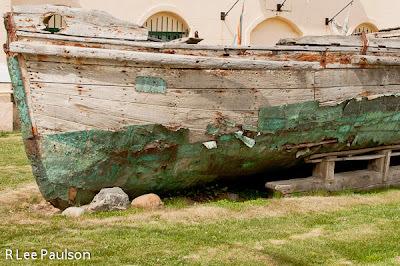 Here's what's left of an old copper clad sealer boat. One can see how thin the copper plates used to waterproof the boat were. 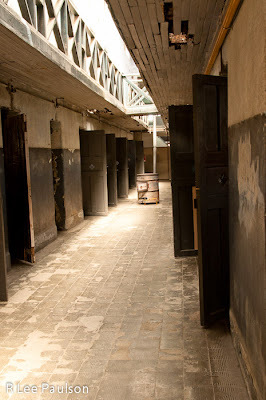 Eventually the prison was closed down and the prisoners sent elsewhere. However, many of the guards, who had brought their families with them stayed and prospered. Gradually, industry was brought in, including several electronics manufacturing plants, and the town grew into the bustling little metropolis it is today. Tourism is an important part of Ushuaia's economy, now, as well. 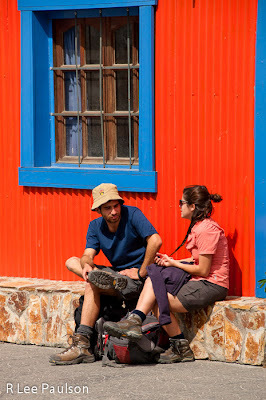 These folks are sitting outside the local youth hostel. 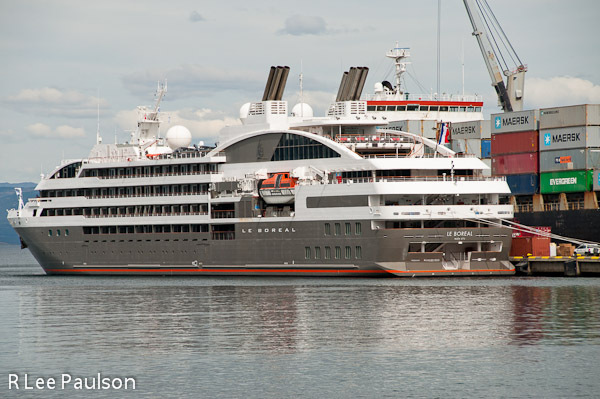 Most of the cruise ships visiting Antarctica sail from and are provisioned out of here. Ours was the last bus to board Le Boreal, seen here in the background, over shadowed by a large container ship on the dock behind it. So we had extra time to explore Ushuaia and get our photo taken. 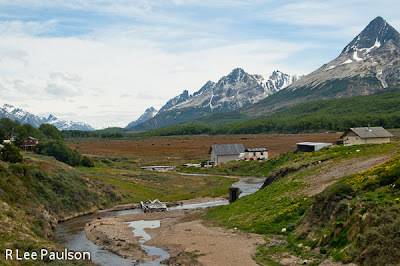 Fin del mundo translated means end of the world. The extra time also allowed the daughter of our bus hostess to flirt with my camera. Here's a better look at our ship. Le Boreal is 466 feet long. Small for a cruise ship, she only carries 200 passengers on her voyages to Antarctica. One thing about this ship really won me over. Every passenger cabin on Le Boreal's Antarctica cruises has its own private balcony. 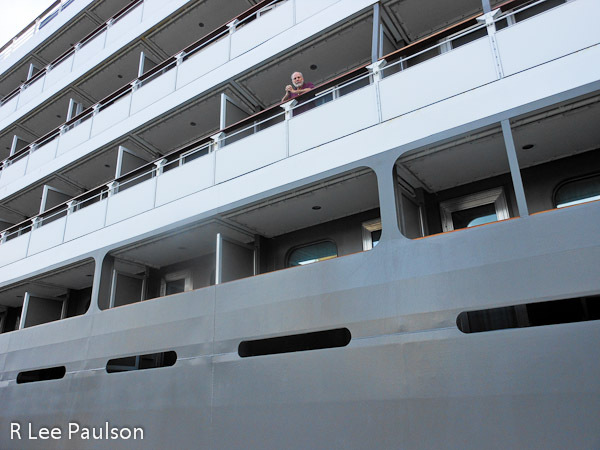 If you ever do a cruise, pay the extra money and get a balcony. Part of the joy of being on the ocean is the ability to step outside our cabin onto our balcony and look around any time we wanted. 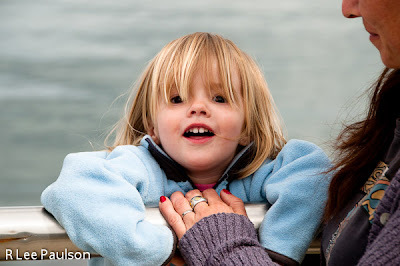 At last, it was our turn to be driven out to the dock. 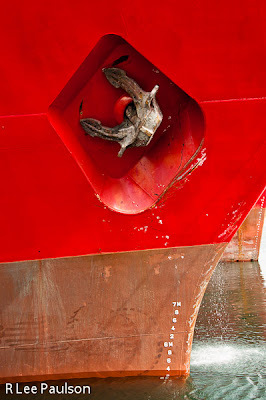 I grabbed this frame of two huge fishing ships moored side by side as I stepped off the bus and walked down the pier. 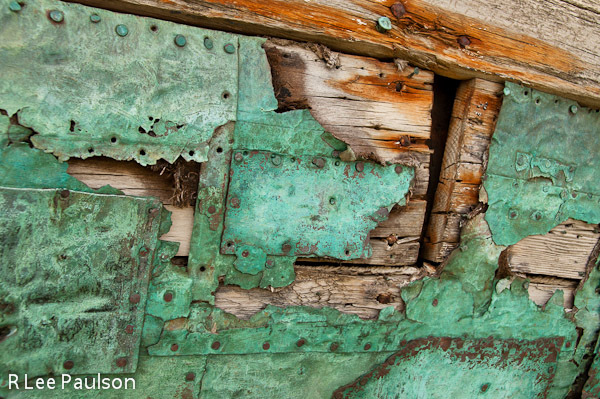 Continue on to Post 14: We Set Sail, by clicking here. I always thought that there is a lot of snow in the Antarctic but there is no snow on your pictures. My dream is antarctic cruise, something like http://poseidonexpeditions.com/antarctica/. I will gather up money for this tour and i will complete my dream.